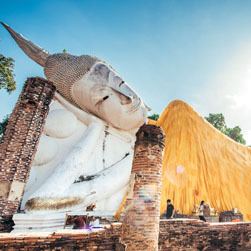 The former capital of the Lanna Kingdom in the 13th century, Chiang Mai today continues to serve as a cultural and administrative centre of Northern Thailand. Though the metropolitan area of Chiang Mai has a population of more than a million, the historic centre has a laid-back atmosphere more akin to a provincial town than a capital city. Beyond the Old City there is vast green countryside and rainforests ideal for trekking and exploring the ethnic minority villages. Chiang Mai International Airport is the gateway to northern Thailand destinations with a domestic and international terminal. The airport is 4km/2.5 miles from the city centre.